“I will never rest until the gospel is preached around the world,” I told reporters in Dayton, Ohio, when I arrived to speak at a district conference in summer 1938. “Ours is a colossal task, but not an impossible one.” I pointed out to the newsmen that, at that time, The Foursquare Church supported 188 foreign mission stations. Then came World War II. 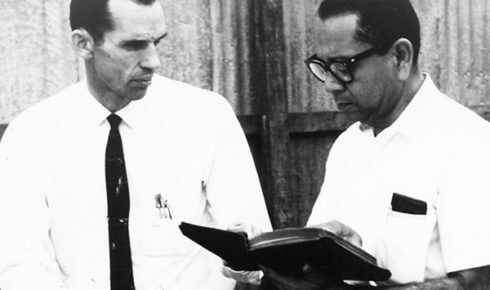 The outbreak of the war and America’s subsequent involvement hindered several plans of the missionary department to spread the Word to untouched regions. But it also afforded us an opportunity to minister to thousands of servicemen who would pass through Los Angeles. Each Sunday, hundreds of men in uniform attended services at Angelus Temple. The overwhelming majority of these had never been in a Foursquare or Pentecostal church before. Many of them had no religious affiliation and did not own Bibles. What a privilege it was to invite the servicemen present in every Sunday night meeting to come to the platform, where I greeted them, gave each one a New Testament, and knelt in prayer with them for their spiritual needs, and God’s guidance and protection on their lives. Later, when the altar call would be given, many of these same servicemen would make another trip to the platform publicly to receive Jesus Christ as their personal savior. Travel within the U.S. was not curtailed until after the attack on Pearl Harbor, when gasoline and tire rationing was instituted. It was possible for me to conduct a 25,000-mile evangelistic tour in summer 1940, and another less ambitious journey the following year. After December 7, 1941, I was able to conduct individual meetings from time to time in selected cities. The war affected the Temple program. At the time that Hitler’s forces were overrunning France, Belgium and Holland, we instituted a series of all-night prayer meetings every Friday night. President Franklin D. Roosevelt, through his secretary, Mr. Stephen Early, expressed appreciation for these efforts, as did the governor of California and other public officials. Government regulations that public buildings prepare for blackouts made it necessary for a thorough and painstaking job to be done on every door, window and other outlet for light. Even the stained-glass windows had to be covered, and the dome was painted black. Moreover, my son, Rolf, announced publicly that we were prepared to convert the edifice into an air-raid shelter if grave emergency made this necessary. We also instituted first-aid classes and, on one Sunday evening, simulated an air-raid emergency to test the knowledge of the Bible college students and to give them practical experience. The war had an effect on our radio station, also. Because transmitter tubes could not be easily replaced, it was deemed necessary to cease broadcasting at 11 p.m. No longer could my Sunday morning and evening services be rebroadcast between midnight and 3 a.m., reaching radio fans from coast to coast. We determined to comply strictly with the wartime regulations set up by the Office of Censorship in Washington, D.C. Our radio manager explained that the granting of certain telephone requests had been forbidden. For example, a person might ask for a favorite singer to present a certain hymn. However, if he asked for it to be performed on a certain date, the request could not be granted. In the matter of reading letters over the air, it was necessary to change the wording in order to break the original succession of letters and their numerical values, in case a code message might be contained in the letter. We were also discouraged from permitting messages in tongues and interpretation to be aired. As loyal Americans, we cooperated as best we could with the war effort, and several citations of appreciation from government agencies were received. We also sent Foursquare Crusader magazines to army camps. It was a privilege to make war bonds and stamps available to the public at Angelus Temple. And I took our musical department to Victory House in Pershing Square in downtown Los Angeles, where we conducted a program to encourage the sale of bonds and prayer for the war effort. Entertainers had been performing their songs and dances there, and I announced that if some could dance for victory, others could pray for victory. The press reported that record crowds gathered for the occasion, and estimated that upwards of $150,000 was subscribed in the sale of bonds and stamps on June 20, 1942. Two years later, on July 4, we returned for a similar effort. Adapted from Aimee: The Life Story of Aimee Semple McPherson by Aimee Semple McPherson, copyright 1979. Published by the International Church of the Foursquare Gospel. 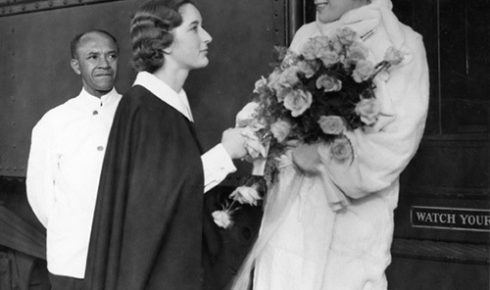 Aimee Semple McPherson	founded The Foursquare Church in 1923 in Los Angeles.